모포줄은 오래전부터 전해지는 모포리 줄다리기 행사에서 사용되는 줄다리기 줄이다. 모포리에서는 마을의 풍요와 평화를 기원하기 위해 매년 정초에는 당제를 지내고, 음력 8월 16일에는 골매기당에 모셔져 있는 줄을 꺼내어 줄다리기를 한다. 이때 승리하는 마을에는 풍년이 든다고 한다. 줄다리기는 동·서로 나뉘어 진행되는데, 바다 쪽 마을들이 동편이 되고 산 쪽 마을들은 서편이 된다. 동편은 줄이 맞물리는 부분의 올가미모양 고리가 큰 암줄을, 서편은 작은 숫줄을 사용한다. 줄다리기가 끝나며 줄은 다시 골매기당에 모셔진다. 당 내부의 마루바닥 위에 암줄을 똬리 틀듯 둥굴게 말아놓고 그 위에 숫줄을 올려 놓는데, 할배신과 할매신의 교합상태를 보이는 듯하다. 그 모습대로 골매기신으로 모셔지다가 1년에 한 번씩 줄다리기 줄로 사용되는 것이다. 줄을 오래 보존하기 위해 볏짚에 칡넝쿨이나 피나무 껍질을 혼합하여 만든다. 모포줄의 정확한 제작시기는 알 수 없으나 조선시대에 만들어진 것으로 보인다. 보통 줄다리기가 끝난 줄은 버려지거나 태워지는 것과는 달리 이곳 모포리에서는 민간신앙대상물로 모셔두는게 특징적이다. 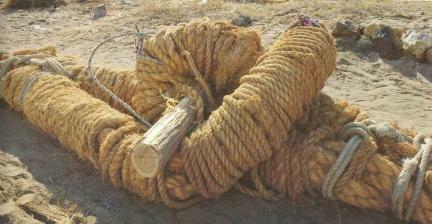 This set of ropes is used for tug of war, a traditional event in Mopo-ri. 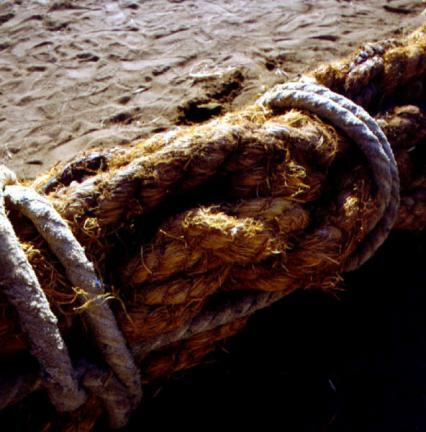 Consequently, they are not regular ropes but are considered a precious object of folk beliefs. The ropes are being kept in golmaegidang (ritual house for a village guardian deity) at the foot of Noeseongsan Mountain and are regarded as a village guardian. Villagers dedicate a rite annually at the beginning of the year, praying for good harvest and peace. Then, on August 16 in the lunar calendar, they hold a tug of war event with the ropes kept in the golmaegdang, believing that the winning village will have a good harvest. For the tug of war event, villages are divided into the east and west teams. Typically, a village on the coast side is designated as the east team, and the one on the mountainside, as the west team. The ropes are made into a big, noose-shaped loop to symbolize a female rope and a small loop to represent a male rope. 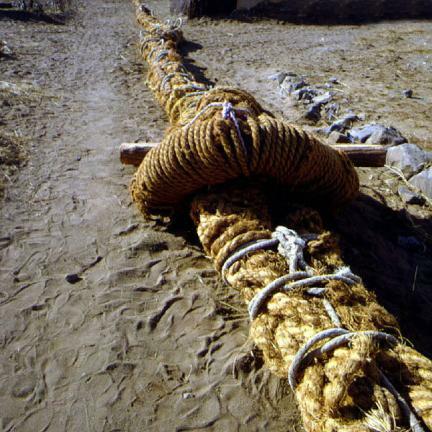 The female rope is assigned to the east team, and the male rope, to the west team. 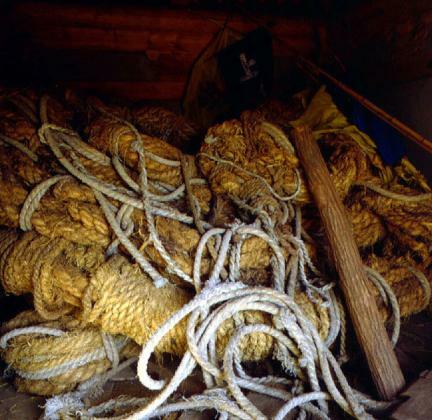 After the event, the ropes are stored at the golmaegidang. To make the ropes last a long time, arrowroot vines and linden tree bark were mixed with straw when braiding ropes. 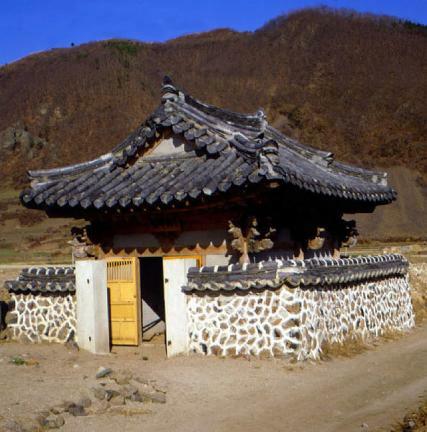 The exact production period of the Mopo-ri ropes is unknown, but they seem to have been made during the Joseon Dynasty. 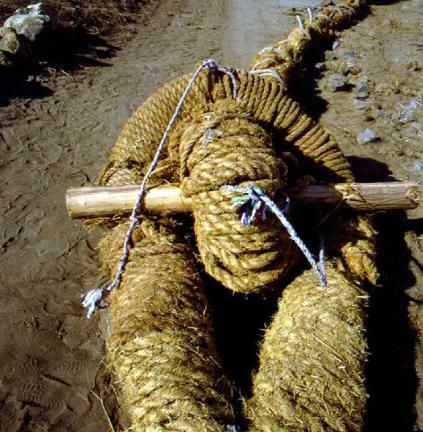 Unlike most ropes, which are either burnt or dumped after a tug of war, these ropes are preserved as a sacred deity; thus, this tradition shows very well that ancient people chose a variety of things as their folk beliefs. In that sense, this artifact has high cultural value.